Because cats can be asymptomatic shedders of FeLV and transmit the infection to other cats, it is commonly recommended that cats be tested for FeLV at some point in their lives. We like to test new kittens around 6 months at the time of their spay or neuter. Testing may also occur when cats are acquired as a new pet; when they are exposed to an infected cat; when they are potentially exposed after escaping from the house or being allowed to roam outside; or when they are ill. Testing is also done prior to vaccination against FeLV. Diagnosis of FeLV infection is made from a blood test that is available at our clinic. Initial FeLV test results may be verified in some cases by tests that are done at outside laboratories in order to verifying positive test results. Verification is done not only by performing more than one type of test but also by testing the cat at different times. So what happens if your cat tests positive for FeLV? Some cats appear to spontaneously clear the infection or to reduce the number of virus particles to such a low level that many FeLV tests are negative and the cat remains healthy. There is no specific treatment for FeLV infection. Some antiviral drugs and immune-modulating drugs have been tried, but no treatment is curative. Healthy FeLV-positive cats do not require any specific therapy. Cats that are FeLV-positive and have clinical signs are treated with medications and supportive care for those signs. Cats with FeLV infection should be kept indoors and isolated from non-infected cats which is sometimes difficult in a multiple cat house hold. Infected cats should not be bred, because the virus may be transmitted to the unborn kittens. The American Association of Feline Practitioners recommends that healthy FeLV infected cats visit a veterinarian at least twice a year for a physical examination and a complete blood count, and that a serum biochemistry panel and urinalysis be done at least once a year. FeLV-positive cats do not benefit from vaccination for FeLV; however, they may receive other routine feline vaccinations (for feline rhinotracheitis, calcivirus, and panleukopenia virus, as well as rabies) as long as they remain healthy. FeLV vaccinations are not routinely recommended for low-risk cats, such as indoor cats, cats in a single-cat household, and cats in a household where all cats have tested negative. 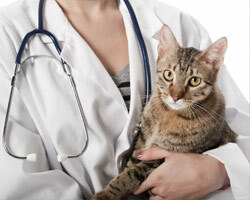 Vaccination may be considered for high-risk cats, so discuss this option with your veterinarian. Adult cats with FeLV infection may live a normal, healthy life for many years. Cats that are infected as kittens or are ill at the time of the diagnosis have a guarded (uncertain) to poor prognosis.